1. Machine body: It used the concrete feet, microcomputer control with high precision and high stability. 2. Worktable rotating: The worktable can rotate by 0-360 degree for 45,90,180,270,360 degree. 3. 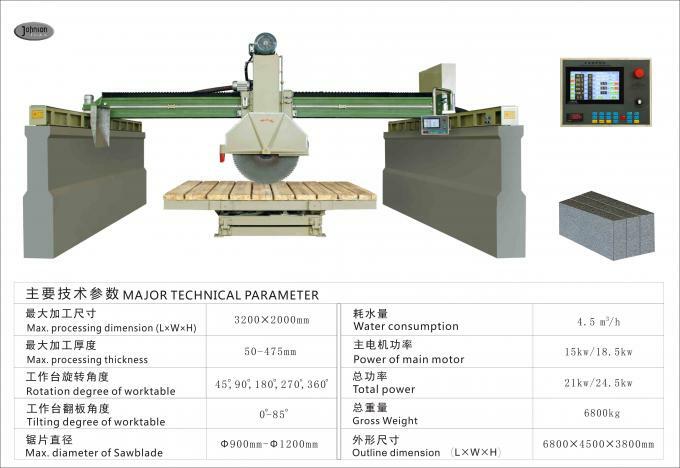 Blade head: The blade head can install the blade for diameter 900~1200mm to cut the block for marble and granite. 4. Operating: The operating for the machine is use the touch screen which is the easy way for understand even without trading the worker. The language is showed in English and the cutting unit is Inch. 5. Electronic component: The electronic component most is from Japan, for example Hitachi, Omron, Mitsubishi and NSK. The other is from Danfoss, Atonics and Schneider. So the machine is with the good quality and low failure rate for working. 6. Delivery time: 30 days after received the 30% of deposit. 7. Payment term: 30% as deposit by T／T, the 70% of balance should be paid before the container loading. Style: Vertical Diamond core drill with 2 gear speed regulation. Drilling materials: Concrete, Reinforced concrete. Suitable installed size: 18mm to 250mm.